Hi! It’s my turn to write a post for the “Around the World Blog Hop.” This post will be heavy on photos. 🙂 Some of my quilts will be at the bottom. I was tagged by Bethany of Sew Ruthie. She is a fellow quilter and we both also love entering giveaways. We “know” each other through our blogs and Instagram. You never know, maybe someday we’ll meet in a quilt shop or at a conference! 🙂 She wrote her blog hop post last week and is showing many of her lovely quilts in her post. I was also tagged in September by the lovely Lori of Sew Psyched. Lori and I also met on Instagram and we read each other’s blogs. She is the nicest person. I’ve never met her but I feel like we’re old friends. You’ve gotta check out her blog too because she has amazing and funny stories about living in Alaska and her encounters with the wildlife that lives there as well as her beautiful quilts. Back in September I was having a baby and couldn’t commit to posting on time but here I am today. So! That’s how I came to be writing this post. It’s Thanksgiving Monday here in Canada so HAPPY THANKSGIVING! We had our turkey supper yesterday. My Mom, Dad, brother, sister and Grandma all came out to Wainwright from Edmonton. It’s a 2 hour drive so not too bad. Mom and Dad came on Saturday and they prepared Thanksgiving dinner. Well, mostly Mom did the cooking but my Dad helped too. My husband and I are pretty busy with out new baby plus our other two kids but it was nice to be able to “host” even though we weren’t cooking. For those who haven’t been to my blog before, Welcome! I’ve been out for a few walks this week to take some photos to show you. 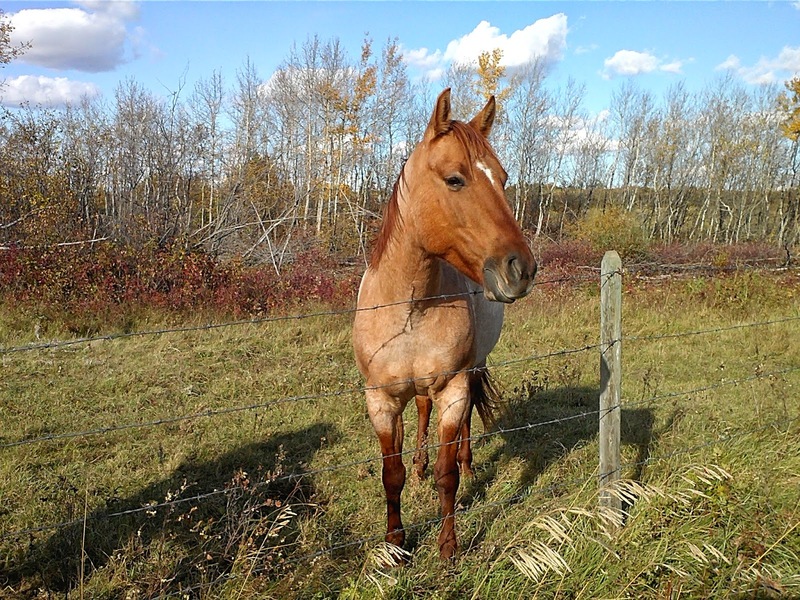 There is a horse paddock at the end of our street and we often walk down there to see the horses. 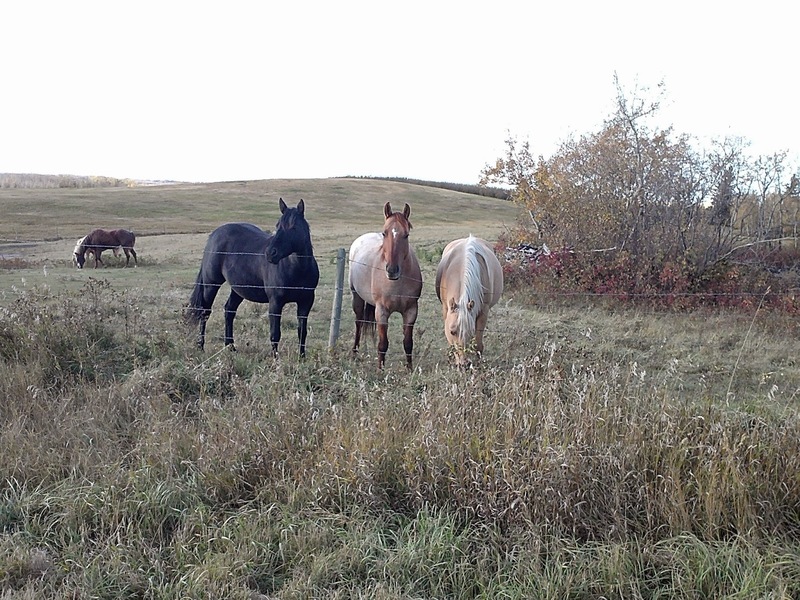 These three were very friendly last Sunday and came to the fence for pets. Aren’t they beautiful? We don’t have horses but we do enjoy visiting with them. This one really likes being petted and has a marking that looks like a lightning bolt on his forehead. The neighbourhood where we live. 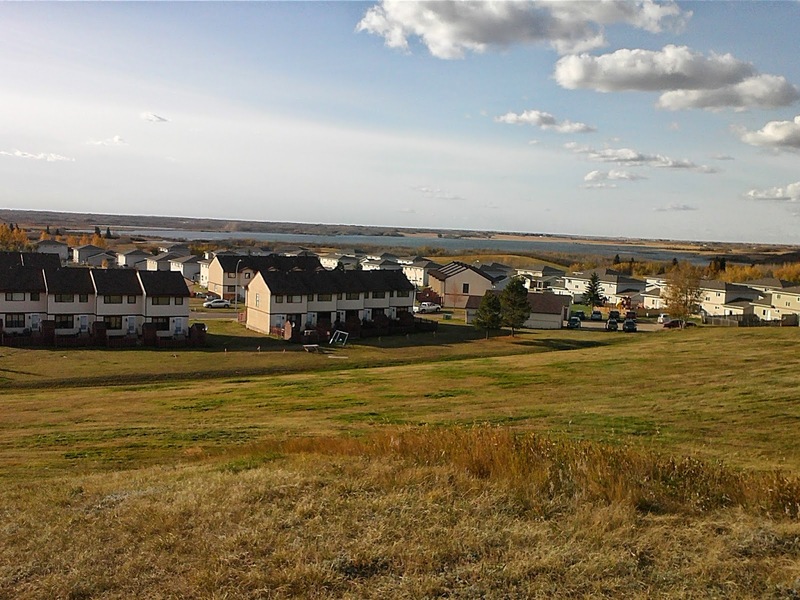 The horse paddock is in behind the houses between the houses and the lake. I was trying to get a close-up of this Great Plains Bison but he saw me coming and started running. Literally running! Here he is trotting away. The bison live in another paddock. They are one of the town of Wainwright’s tourist attractions. 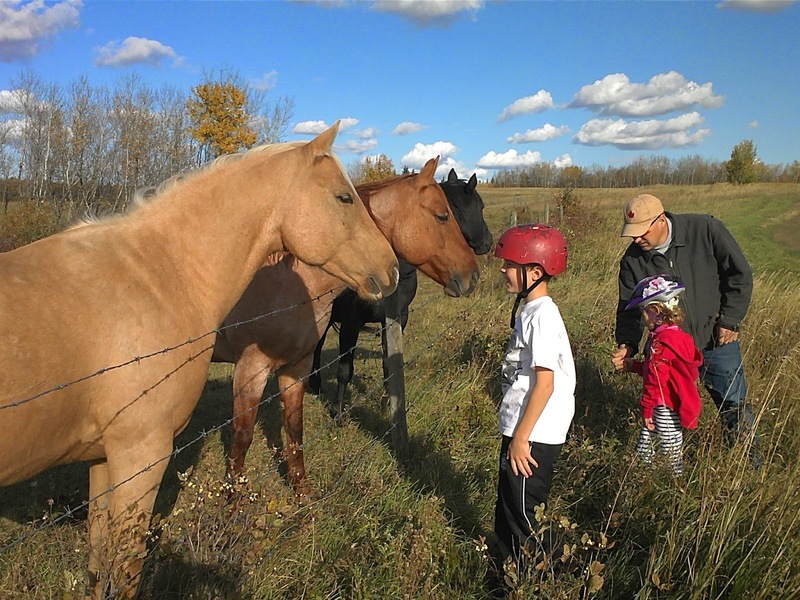 We used to live in Edmonton but we are really enjoying the more relaxed pace of living in the country. It’s much quieter here too. Sometimes at night we hear the railway trains blowing their horns and that usually sets the coyotes off howling but at least we don’t hear traffic noise! I am currently working on the “Scattered” quilt from the book “Modern Quilts From the Blogging Universe.” I just need to sew the squares into rows and put the top together. The squares are all stacked up by my sewing machine but I’ve been too busy to sew them together yet. I am also working on an elephant wall hanging for my doctor who delivered my baby to thank him for being an awesome doctor and for basically saving my life. He came to Canada from South Africa so I am trying for an elephant in a African sunset type of look. I will show it here when it’s finished. Sometimes I make a quilt almost exactly as the pattern writer made it just because I love the quilt on the pattern so much. Sometimes, as above, I use different fabrics in the pattern. I do often use patterns for the quilts I sew so in that way my work isn’t always different. Sometimes I do also “invent” my own quilts, or “improv” them, as in the wall hanging below. Maple Leaf Modern Mini by Anita LaHay. One of the things I find comforting about quilting is that there’s an order to things. First choosing the pattern or drawing up my design. Then choosing the fabrics and auditioning them for the quilt. (One of the best parts!) Then cutting, piecing, quilting and binding. So in that way the projects have their own process. I’m just immersed in it. And so is my sewing room judging by the mess! I could go on but if you’ve made it this far you are probably needing a coffee! So I’ll tag two more bloggers to keep the blog hop going. Please visit their blogs and show them some love! Their posts will be up next Monday. I am tagging Erin of Wild Creative Soul . She is a writer and fellow quilter as well as a mother, birthing doula and early childhood educator among many other talents. Plus, an all around wonderful person. I am also tagging Willa of Jawk Studio who is also a wonderful quilter and she does creative work in her professional life as well. She and I met through Instagram when we both joined a birthday club for Canadians! We are having loads of fun getting to know other quilters in our country through the club where we create and buy birthday gifts for each other. A strawberry mini I made for the Strawberry Swap on Instagram. Camille Roskelley’s “Hashtag” quilt that I finished in August and donated to a charity. Hand embroidered and sewn gifts for the birthday club’s September birthday girl. A Great Plains Bison in winter. I am not looking forward to the cold coming back. Apparently we are in for a long cold winter this year. Thank you for sharing so much about where you live! I have always wanted to visit Alberta and after seeing these pictures, I want to visit even more. It is so generous of you to make all of the quilts to give as gifts! And thank you for continuing the blog hop! Love your pics, both of animals and quilts. Living in North Central Sask we have the same terrain. 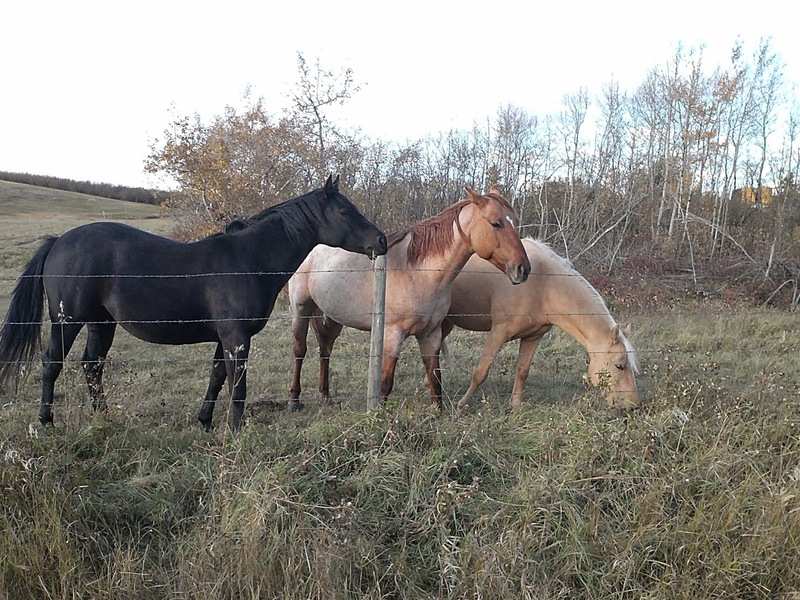 Even have 2 horses at the end of our street also. Sometimes they come to the fence, sometimes they just ignore me. Wow! The country side around you looks beautiful. Hubby and I have always talked about visiting Canada (brief period there we thought we'd move to Canada) – one day! 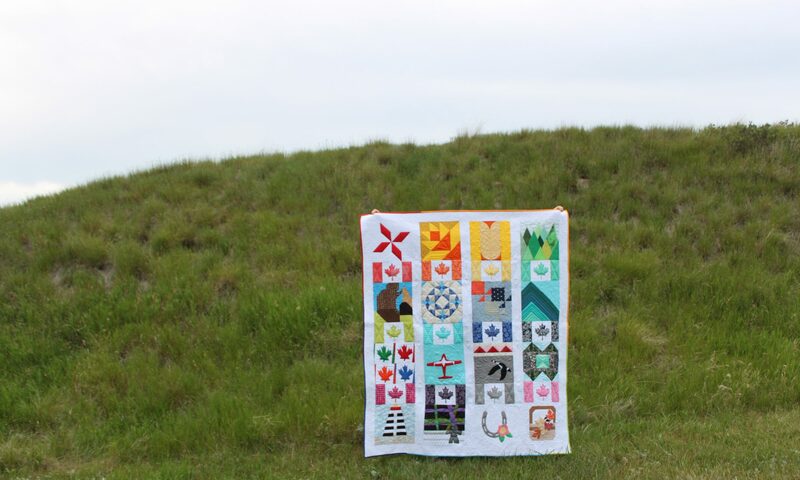 I fell in love with your rainbow maple leaves quilt in Sewvivor – it's so stunning. I love the maple leaf swirl quilt as well. You have fun and that shines through in your quilts. Thanks for sharing! Hi Jacqueline. Leaving you a comment here because you are "no reply" and I don't want you to think I ignored your very kind comment so I hope you check back here. 🙂 Thank you so much for your kind words. I spent a summer in Saskatchewan. It's beautiful country there too. That's so cool that we both have horses at the end of our streets. So nice to read a little more about you, Anita! Glad to meet another Canadian quilter!!! Your photos are lovely. We also live in the country, so I know how much you must enjoy it too. Your quilts are beautiful. I especially like your maple leaf wall hanging!